The Department of Emergency Management invites you to participate in their Run Tsunami Run 5K Walk and Run to mark the 2019 Tsunami and Earthquake Smart Month. The event was designed to raise awareness about the tsunami hazard and promote appropriate evacuation routes. The challenge take the evacuation route from the Brighton Junction, St. George. Route: From the Brighton junction along Brighton Road to Highway 1 (Carlton/A1), Highway 1 to St. Stephen’s Hill junction with Highway 1, St. Stephen’s Hill to Goddard’s Road. 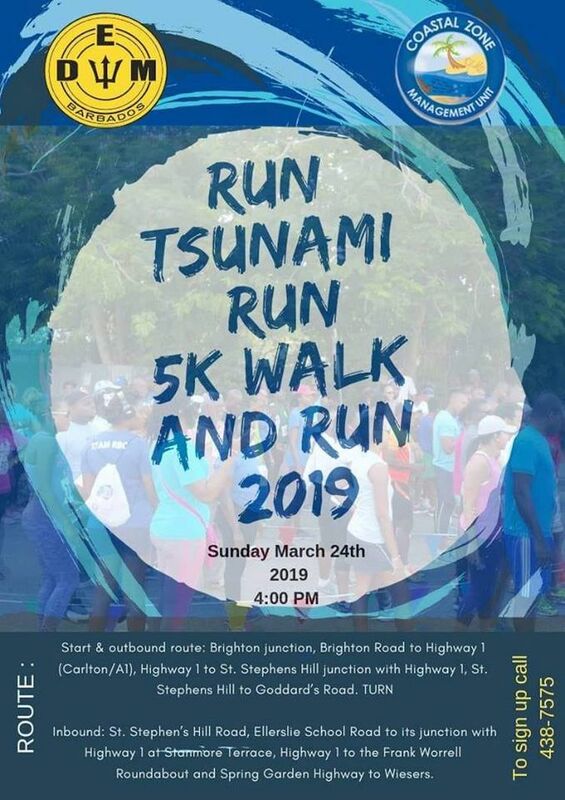 Participants will then turn onto St. Stephen’s Hill Road, Ellerslie School Road to its junction with Highway 1 at Stanmore Terrace, Highway 1 to the Frank Worrell Roundabout and the Spring Garden Highway to Weisers. Contact the Department of Emergency Management at 438-7575 to register.